Boscobel Primary, Jamaica. Can you help? My holiday to Jamaica was chock-full of amazing, crazy experiences and I am in the middle of writing a separate blog post about it, but I just wanted to share an uplifting experience that definitely opened my eyes and is worth sharing. In the lead up to Jamaica, my dad had been gathering football tops together as he wanted to find some Jamaican children playing football and hand them out to them. With the help of others, we managed to accumulate a bulk of Padnell Rovers kits which were kindly donated by the club secretary, Damian Ray, and Portsmouth FC tops from ourselves and others, in company with a few pairs of football boots, medals and a football. Whilst in Jamaica, we gave some of the larger Pompey tops to our accommodation owner, Mr Thompson, his gardener, and also the taxi driver who wanted one for his son.. funnily enough he had the same last name as us too ‘Clarke’. I think the royal blue looked rather good on the Jamaicans and they loved them too! We stayed on a farm with various other properties on it and soon met our neighbours, a retired couple from Canada. They were staying in Jamaica for 2 months because one of them, Sharon is a teacher and volunteers at the local school, Boscobel Primary. This was an instant link for my dad and on the first day my dad was introduced to the school principal by Sharon. My dad explained to the principal that he has come all the way from England and has two bags full of football kits and a few pairs of football boots that he would love to donate to the school. The principal was so overwhelmed by it that she was close to tears. Something that is so little to us meant the world to her. We didn’t think it would have this much of an effect on the school and how much it would help them. The young local Jamaicans then wanted a game of football every day… “be up the field at 5pm”. One afternoon, whilst travelling back from the blue lagoon, (in the back of a truck may I add), we spotted a football match being played and us being the football fans we are asked Mr Thompson if we could stop off and watch. I have never seen a football match like it. Only a handful of the young footballers had football boots on, one child had one trainer on and the other foot was bare and the majority of them were playing barefoot. They were playing on an uneven, stony pitch with no shocks or shin pads, no corner flags – there weren’t even white lines on the ground! The goals would not be legal in England and would be seen as a health hazard as they were metal and would often collapse if the ball hit them. They didn’t have nets on the ‘goal posts’ either. We didn’t spot any first aid bags or water bottles and they didn’t even have kit; they were all wearing bibs. The two managers for each team didn’t offer any positive advice and often laughed at mistakes that were being made, (I know it’s a laid back country but these lads have potential and need to be directed). Football wise, they were all very physical when playing. They got stuck into the game and weren’t scared of getting hurt or going in for a tackle. A few of the players look really quick with good ball control and were clearly talented players. One thing I will say is that they all have tough, hard feet. I would not be able to run around on a stony, rocky field without stopping every 2 minutes due to the pain in my feet! 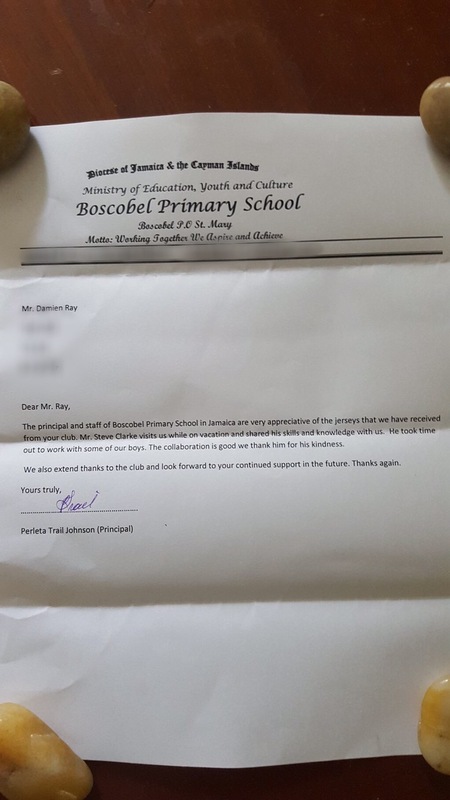 The principal at Boscobel planned a football training session with the schools football team with my dad as the coach, (and help from my brother and boyfriend). My dad has been involved in youth football for 10 years and has always been a successful football coach, taking his team from the D league to the top of the A league in 4 consecutive seasons and then winning the Portsmouth Cup. He is currently the Director of Football and Manager to the u14’s youth team at Padnell Rovers football club. Now can you understand why my dad was so excited by this? The weather was overcast that day with a little bit of rain in the morning, but it was a good day to play football. Before the training session, we went into the school to speak to the principal and another member of staff there who did three jobs – first aider, sports teacher and security officer. We were sat in the school whilst a lot of the children were on lunch break. They loved us and were surrounding us. They were all quick to point at my bob Marley tattoo on my thigh, they all knew who he was obviously and even had Bobs quotes on the walls of their school. A group of little girls were surrounding me, touching my hair and asking me if it was real; one little girl could not stop touching my face and hair. She told me she really liked me, how pretty I was and kept hugging me. My heart melted a little, not gonna lie. I guess I’m not something they see everyday – a pale blonde woman with green eyes… it’s like they were fascinated by me, but they were cute and I enjoyed speaking to them. All the children were very hyper, running up and down the middle of the school. The school was small, it had one massive hallway and then different classrooms on each side. The principal told me she has 10 teachers in total. The little boys were typical boys, pushing each other around. One of them had beautiful bright eyes. When it came to the training session, all the little lads came out dressed in Padnell Rovers kits and also Pompey tops and shorts. They looked the part. All of the children were respectable and enjoyed the session. They replied to everything my dad said to them with “yes Sir”.. my dad told them to call him Steve. They understood everything my dad told them and enjoyed the training drills. My dad told them how he wanted them to play and we instantly saw an improvement as they all listened carefully and wanted to learn. It’s a shame our stay there wasn’t longer; I think it would take 6 weeks at one training session per week to get them to the point of staying in position, passing and moving and keeping the formation. They liked being told what to do and understood everything my dad was telling them. We played the crossbar challenge with them. For those that don’t know about football, the crossbar challenge is when you have to aim for the ball to hit the top post on the football goal post. None of them had heard of it before but they all thoroughly enjoyed it and the winner of the challenge was a happy boy. I wonder if they’re playing it at school now – I bet they are! When we spoke to the principal of the school, we were keen to ask her some questions in regards to the way the school is run and what facilities they have. She told us that she doesn’t even have a laptop to run the school and that everything is handwritten, taking her a long time to get anything done. Considering you can purchase a decent laptop for £200-£400, this really opened my eyes. We don’t realise how lucky we are. I wasn’t the biggest fan of school like many, but I never really appreciated the fact that we had workbooks to write in, computers to work on, a library full of books, projectors, stationary etc. The football team usually play in bibs and the school also provides some of the players with very old football boots that were falling apart. They had very little or no equipment whatsoever. And that is when we decided that we wanted to help this school and community – essentially be their sponsor and provide a charity. We want to provide the school with football kit in different sizes, football boots for all of the children in the football team and we also want to provide the principal with a laptop to make her work life a lot easier. It was evident that the principal loved and respected those children and it warmed my heart seeing her comfort a young child who was upset, wrapping her arms around him. You could see that those children appreciated and respected her too and considering she was close to tears when we donated the football gear, I think it would make her day to receive a laptop. It’s the least we can do for such a lovely and hard-working woman. Please click the link and help us in any way possible. We want to give this school the essentials they need to allow the children to progress in life. Trust me when I say the Jamaicans believe that children are the most important humans in the world. ‘They’re our future’ as they say. I’d love it if people could share the blog post if possible, it all touched my heart and we really want to help them. If you can donate as little or as much as you want or have any fundraising ideas or any ways on how you can help us help this primary school and the children of Jamaica then please message me via social media, (I’m on Instagram & twitter only), or email me at shannonmclarke94@gmail.com. You can also email my dad; stevekc67@ntlworld.com. Again, as soon as we have the link it will be post. The smallest thing means the world to them. I’m not rich myself, but I do know that I am better off than them and something that can cost or mean so little to me can mean everything to them. Thank you for reading and ONE LOVE.